This picture was taken in the Bahamas at a location known as Tiger beach. The sharks are attracted by the boxes of dead fish that you can see in the box behind the dive guide. 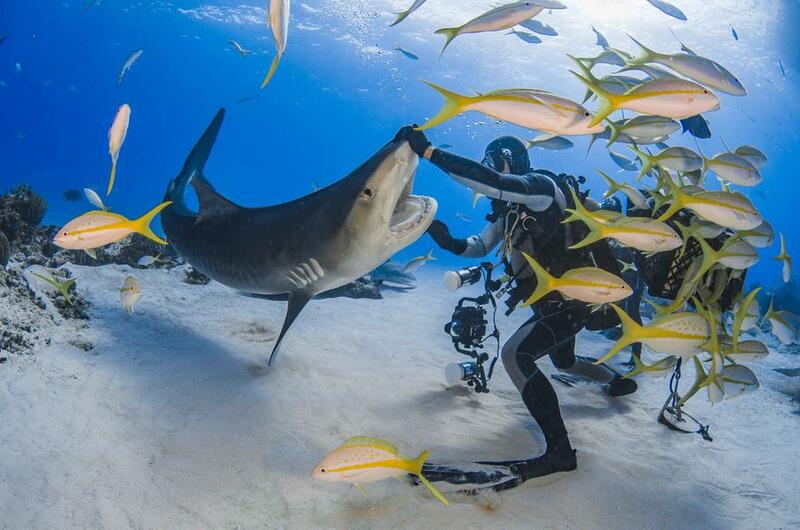 The job of the dive guide is to stop the Tiger sharks from getting to the bait box and ripping it apart. This sounds a bit scary, but the sharks are not at all aggressive and can be guided away with a gentle push on the nose or, in the photographer's case, using your camera to ease them away. When you first arrive on site and it’s time to get in the water, you find it‘s very counter intuitive to enter the water with a dozen sharks swimming around the back of the boat. You have to enter the water as quietly as possible so the sharks won’t get excited. You also have to wear all black scuba gear and clothing, as certain colours seem to spike their curiosity. Being in about 20ft of water and bright sun helps with the lighting, but I also use twin strobe flashes to put a bit of colour in the scene. Gear wise, I use a Nikon D7000 with a Tokina 10-17mm lens. The Tokina is a great underwater lens as it will focus right onto your underwater dome, which helps eliminate the distance between you and the subject, hence less water to shoot through. This particular shark was really interested in us and our gear. I actually have shots of him attempting to eat the guide’s camera. The sharks mainly approach from downstream and that helps anticipate what shots you’ll come away with. As well as the serious sharks (Tigers) you can have twenty or thirty Lemon or Caribbean reef sharks swimming around. These offer great photo opportunities, too. As the water is so shallow, dives can range around 90-minute mark, so there’s plenty of time to move around and try different things. In 2014, I went on a dive trip to the Jardines de la Reina, an archipelago on the south side of Cuba. 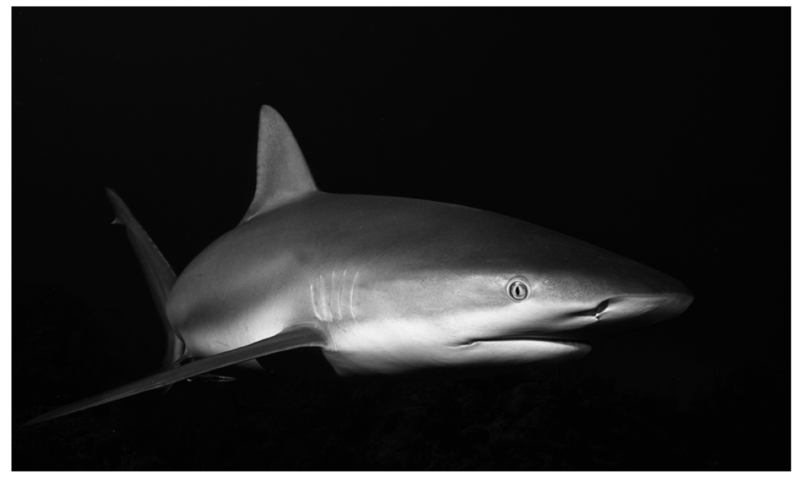 My aim was to photograph some of the sharks that haunt the waters in the area. Each dive, a bait box was filled with a fish carcass. Before long, the sea was full of Caribbean reef sharks. The species is mostly harmless to divers, which allows you to get quite close to them. However, a little further away from the bait box, I could see the sharks circling before going back to feed and I had an idea to position myself underneath the dive boat. I could see it was positioned just beneath the sun and thought I could try and photograph a shark swimming underneath the boat. At that depth, any shark would have been a silhouette without flash light. This meant using manual mode, and metering for the boat from 20 metres underwater and for the shark in between to be lit by the flash of my strobes. The flash light only works a metre or so underwater, so the shark had to be reasonably close. The shot was made more difficult by the movement of the boat in the breeze. To include the sunburst in the image, I had to keep moving to keeping the position of the sun on the edge of the boat. Once in position, I had to anticipate the circling sharks coming into the frame (from either side) and trying to compose the picture balancing the shark, the boat and sunburst, while being close enough to a shark without parts of that shark being clipped by the frame. In all, I spent most of the dive in relatively the same position and taking shot after shot of each passing shark. The best shot was taken halfway through the set. It was close and slightly over me, as well as being fully lit by the strobes. The shot was slightly overexposed as this shark was closer than the others, so I corrected the exposure in Photoshop and dampened the highlights. I also cropped some of the bottom of the image, so the shark was coming from the left-hand-bottom corner of the photo. A big problem taking photographs underwater and looking up, was that the bubbles from my last breath could be seen at the top edge of the picture so I also removed those in post. There are three places in the world where you can reliably experience encounters with Great White sharks - South Africa, Australia, and Guadalupe Island in Mexico. 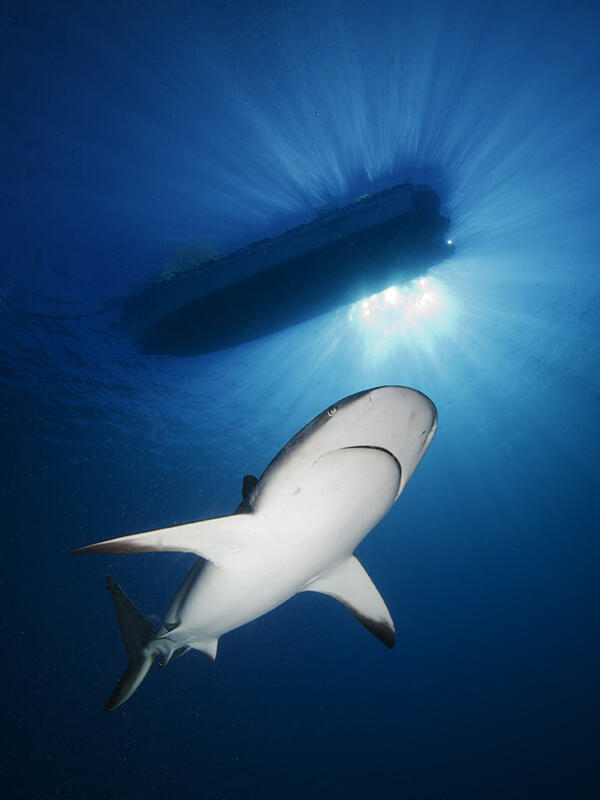 From the photographer's perspective, Guadalupe Island is by far the best destination. 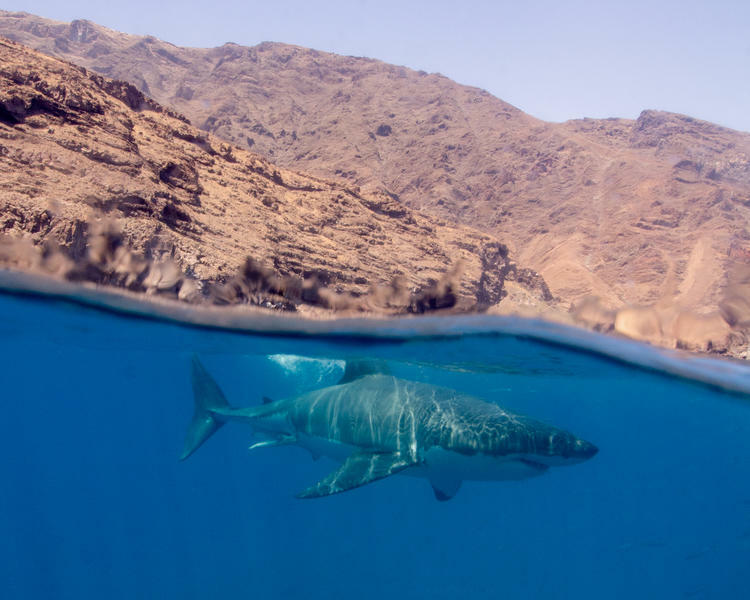 Guadalupe Island is blessed with consistent clear water that routinely has 60-100ft visibility, making it easier to get excellent underwater photographs of Great White sharks. In August of 2017, I took a trip to Guadalupe Island on the Nautilus ‘Under Sea’ ship. High on my list of images to get was a group of Over-Under photographs with the Great White shark in the photograph and the rugged coast of Guadalupe Island in the background. We had three full days of diving once we arrived at Guadalupe Island. The dives were made from two submerged cages that held 2-4 divers and were lowered forty feet under the surface. Each diver had four one-hour sessions each day in the submersible cages. There was also a surface cage attached to the boat that divers could climb in and out of anytime during the day. During the first day, I took hundreds of photos of the sharks below the surface as I got used to the daily diving operations. I had planned on doing over-under photos on the second day, but it was made impossible by the wind picking up, which lowered the underwater visibility and kicked up the surface waves. By the time I went to bed after the second day, I was beginning to believe that I would not have any shot at over-under photos of the sharks. When I woke up and went onto the dive deck on our final dive day, I was thrilled to see the conditions. There was virtually no wind, the water visibility was excellent and there were few clouds. These conditions were perfect for making over-under water images. I was shooting with a Nikon D7000 and a Nikkor 10-24mm lens in Aquatica underwater housing. I did not use strobes as strobe light will only penetrate about 6-10ft underwater and I would not be quite that close to the sharks, thus the strobes would not help light the sharks and would only expose more scatter in the water. As no one is allowed to get out of the cages or have any part of their body outside the cages while submerged, I had worked a plan with the dive masters to allow me to photograph the sharks while sitting on top of the submersible cage while it was at the surface. Over-under photographs are one of the most challenging segments of underwater photography. You must find an interesting subject under the surface and complement that with interesting topography or subjects above the water. Getting appropriate exposure is very challenging, as you are working in two completely different mediums of light within the same photograph. Also, over-under photography must be done in calm conditions as any kind of significant waves will make it virtually impossible. Fortunately, I was blessed with calm conditions and excellent light with great surface visibility. I climbed out onto the cage and took a few test shots and finally settled on camera settings of 1/320sec at f/11 and an ISO of 320. All the shots were taken at a focal length of 10 mm to get the widest view. One of the big challenges of over-under water photography is water beads on the dome, which can absolutely destroy the above water part of the photo. I used a small amount of Baby Shampoo on the dome to try and help prevent large beads to form but ultimately relied on the ‘dip and shoot’ technique. When the camera is held underwater and lifted above the water, it takes 2-3 seconds for beads to form on the dome leaving a brief couple of seconds during which you can shoot without beads on the dome. Thus, when shooting I would dip the entire camera housing underwater and then when ready for the shot I would quickly lift the camera half-way out of the water and get off one or two quick consecutive shots. The other big challenge, I quickly realized, is that I could not see underwater while sitting on the cage and therefore had no idea where the sharks were. The shark wranglers on the boat ended up helping me. When they saw a shark approaching they would yell at me the direction and distance, and I would quickly start dipping and shooting. For around fifteen to twenty minutes, I took dozens of photos and came up with about ten final photos I was happy with. These included one in which the Great White shark's body was completely visible in the photo with its dorsal and caudal fin sticking out of the water. In the background, you can see Guadalupe Island. Great White sharks are among the most beautiful and mysterious large predators on our planet and having the opportunity to photograph them in close proximity was phenomenal.